Max Streicher's Quadriga exhibit at Union Station greets downtown commuters. LuminaTO is in full swing across the city, and despite the flashy Pulse Front and glitzy ROM Crystal main features, artists have appropriated some of Toronto's most iconic public spaces with captivating artwork, dubbing it the Floating Artwork exhibition. Union Station is hosting a pack of giant, hand-sewn horse sculptures, designed by Toronto's Max Streicher. A commentary on the constant hustle and bustle of commuters making their way through Union's Great Hall, Quadriga adds a certain element of majesty to the station. It also invites visitors to look upwards, allowing them to appreciate one of the most grand, and often ignored buildings in the city. 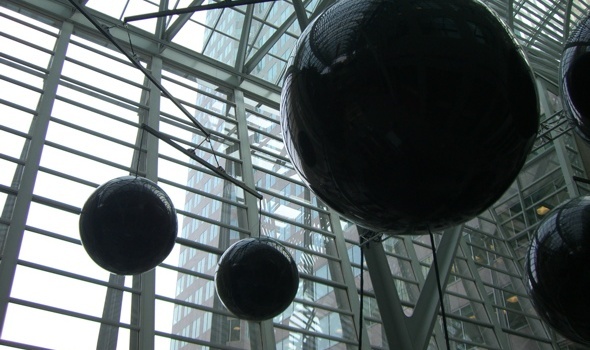 BCE Place, the host of yesterday evening's opening festivities and concert, is adorned with giant black orbs, part of Xavier Veilhan's Le Grand Mobile installation. The orbs hang ominously from the Santiago Calatrava's BCE Galleria and contrast heavily with the canopy of white arches. It's a very organic looking display, with the over-sized mobile hanging gracefully from the gently sloped arches of the Galleria. While Quadriga and Le Grand Mobile dramatically accent the spaces that they occupy, the exhibits over at the Toronto Dominion Centre have a more subtle nature to them. 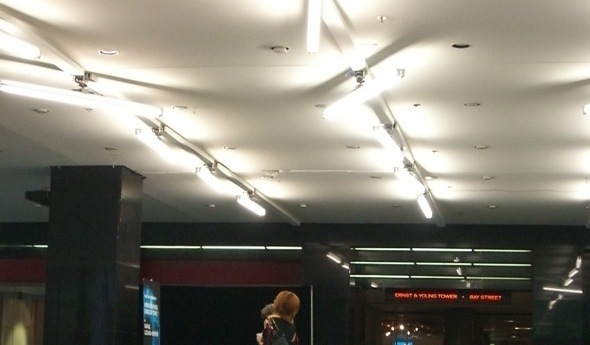 Particularly with Rafael Lozano-Hemmer's interactive lighting installation, Homographies, Subsculpture 7, many passing through the linkway between the TD and Ernst Young towers were often completely oblivious that they were, in fact, creating art. As you pass beneath the dozens of light tubes hanging along the ceiling, they rotate to create connective paths of light all the while emitting a gentle hum much alike gentle waves on a beach as the lights reposition themselves. There was definitely a Nuit Blanche-like feeling to many of the exhibits in the way that they integrated with and provided a welcome and refreshing feeling to the space. All of the Floating Artwork will be on display all day from now until the festival closing on June 10th.